Sir Edwin Landseer’s The Monarch of the Glen is one of the most famous and iconic images of Scotland and the Highlands (and whisky). For the first time since it’s painting in 1851, this resplendent painting is on display in the National Gallery before it returns to Scotland in February 2019. 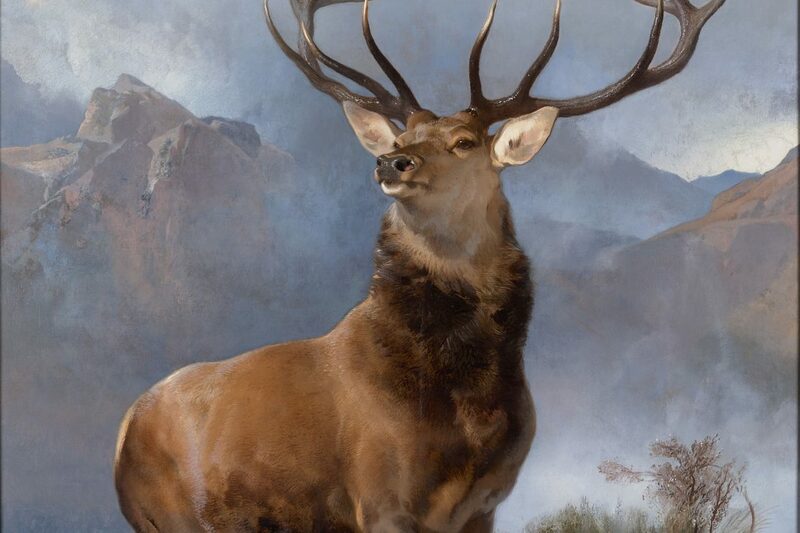 Commissioned for the Houses of Parliament by the decorating commission in charge of filling the new palace with artworks, Monarch of the Glen was originally planned as on of three paintings by Landseer for the refreshment rooms of the House of Lords. Luckily the commission ran out of funding and it was never hung in the Lords. As a result it was sold privately, and thank god it was other wise few of us would have come to know this masterpiece. It is magical. The golden glint off the ends of the horns forming his noble crown. A misty soft pinky red and blue background of mountains, and the light glinting off the due of the grasses in the foreground. This is an animal that is comfortable, powerful and secure in his command of all he surveys. It is a quintessentially romantic image embodying Scottish romanticism and identity, a popular theme and notion of Scotland at the time. Landseer was one of the great animal painters having been inspired by the great equine painter Stubbs, and The Monarch is displayed along side a selection of drawings and paintings that give it this context. In particular he was a great painter of dogs and along side an incredible drawing of a horse’s muscular and skeletal structure by Stubbs, is a fine structural drawing of a dogs paw. The Monarch was to become one of the great advertising images and the exhibition included Sir Peter Blake’s 1966 version also used for advertising. One of Landseer’s other commissions is equally famous – the Lions of Trafalgar Square. 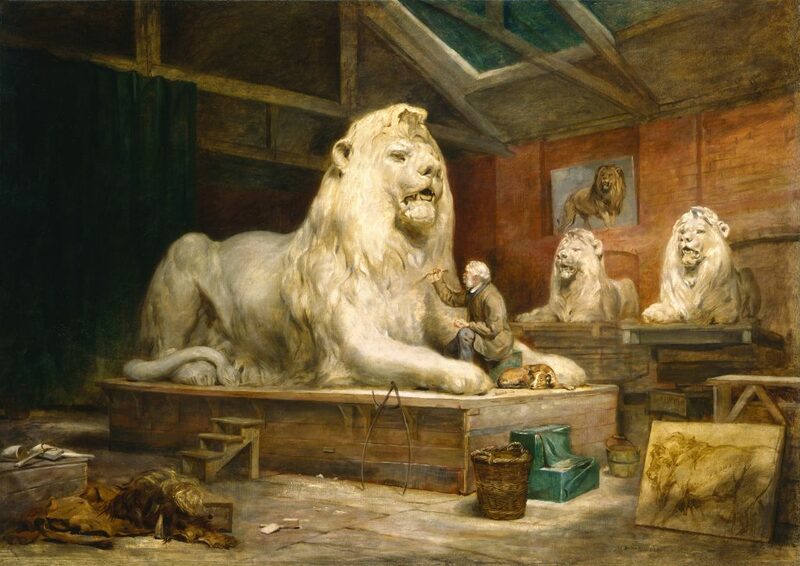 The exhibition also features his preparatory lion studies made at London Zoo, and a painting by John Ballantyne of Landseer sculpting a lion model in clay ahead of its casting in bronze. It’s a fine little exhibition of on of Queen Victoria’s favorite artists responsible for some of the great images and notions of Scotland and Scottishness that we have. 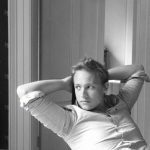 Of course these are highly romanticised notions and far from the reality, as much as many of us might wish hold to them. In The Lion and The Unicorn, a film and exhibition by Rachel Maclean a few rooms away, this notion of Scottish identity is challenged and updated. Importantly Rachel Maclean is a young Scottish artist giving us not just the modern view of Scottish identity but a Scottish perspective on that identity, contrasting against the very English views of Landseer. It’s a thought provoking and whimsical inclusion in the National Gallery’s modern and contemporary exhibition series. Even though they don’t collect modern art, they do bring artist and experts together to talk, discuss, and debate art of all genres. The central work is her film The Lion and The Unicorn commissioned for the then upcoming Scottish referendum. Filmed at Traquair House near the boarder, it has been on both sides over the years and has Jacobite connections. The 11 minute film consists of just three characters, all played by the artist – a queen (a Queen Bess meets milk maid covered in lace and union flag bunting), a lion looking like a red coat, and a unicorn for Scotland. Snippets of recordings of the Queen’s Christmas messages, Jeremy Paxman, Alex Salmon and David Cameron were used to build the script. This modern political messaging juxtaposes with the history-laden imagery of power and the state that the characters imbue – it is a mash up of history, politics and popular culture. Rachael Maclean perfectly lip syncs to the words giving us the English lion of Paxman interviewing the Scottish Unicorn of Alex Salmon about gold reserves if Scotland were it to become independent. A recording from a Newsnight interview of memory serves. The whole thing is both serious and amusing. Accompanying images explore the wider idea of what Scotland has become and its identity. 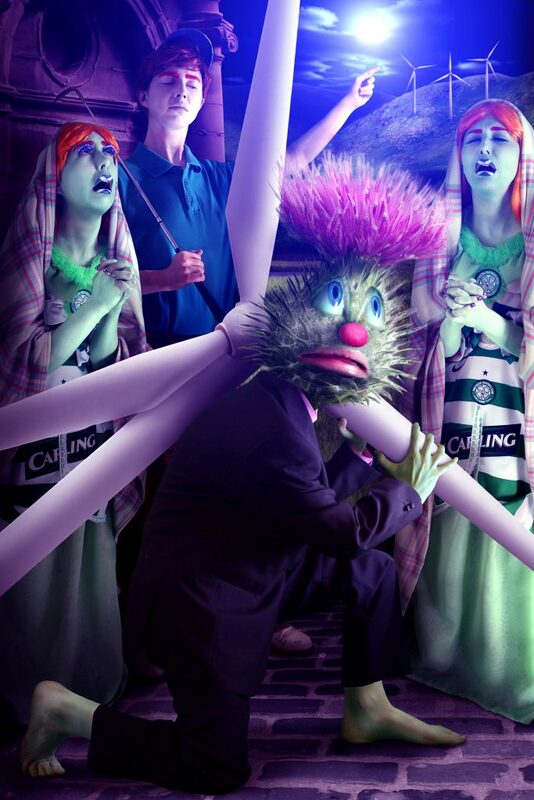 She looks at the themes of energy and religion in one image where a humanoid thistle carries an electric windmill bent double under its weight, surrounded by a baying crowed like Christ and the Cross. While St George the golfing banker kills Nessy on the golf course in another series of works. Both of these small and free exhibitions are independently worth visiting, but taken together they have far more to say lifting one another and reminding one that art and individual works are not isolated, they are part of a wider context and in the case of identity, an ever developing and advancing story.